HP 410A (CF410A) Toner Cartridge, Black. HP 410A (CF410A) toner cartridges work with: HP Color LaserJet Pro M452dn, M452dw, M452nw, MFP M377dw, MFP M477fdn, MFP M477fdw, MFP M477fnw. Original HP toner cartridges produce an average of 71% more usable pages than non-HP cartridges. HP 410A toner cartridge yield (approx. ): 2,300 pages. Original HP toner cartridges are specially designed to work with your printer to consistently deliver standout results throughout the life of your cartridge. Ensure that your printing is right the first time and every time with HP printer toner: 410A toner. 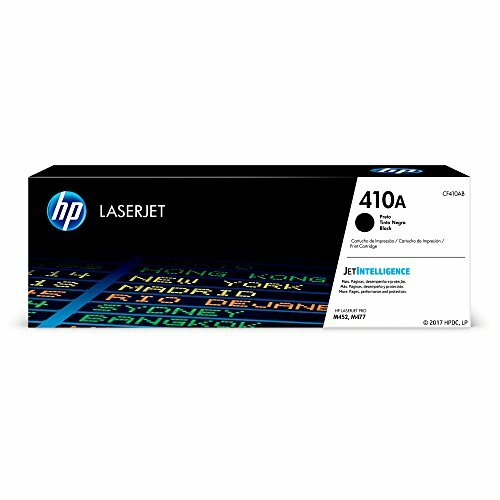 What's in the box: New Original HP 410A (CF410A) toner cartridge Color: Black. HP 410A (CF410A) toner cartridges work with: HP Color LaserJet Pro M452dn, M452dw, M452nw, MFP M377dw, MFP M477fdn, MFP M477fdw, MFP M477fnw. 410A toner is designed to work with your HP printer for high quality, reliable results every print. NEVER SHOP FOR TONER AGAIN - With Amazon Dash Replenishment, your printer tracks your usage and automatically reorders the HP Genuine toner cartridges you need, only when you need them.